If there’s one type of software that’s been around for decades, it’s presentation packages. Systems for creating and displaying professional-grade slides have been available since the 1980s, and they’ve become a standard in the business world. Of course, presentation software has come a long way since then, and modern apps give users the ability to create, edit, format and present some pretty stunning slideshows capable of really wowing an audience, complete with animations and embedded videos. A good presentation program will provide you with all the tools you need to generate and manipulate graphics, and the main aim is that users are able to present their ideas effectively to other people – and do so with pizzazz. There’s nothing worse than having to sit through a mundane, or possibly even boring presentation. Fortunately, these apps generally include stock themes and easy ways of personalising slides to make them interesting and attractive. Microsoft PowerPoint is the most notable presentation software, of course, but it’s been covered to the nth degree (if you want to read up on it, check out our Office 365 review). You will, naturally, do fine with PowerPoint, but there are plenty of other great options out there – and here are five of the best. Branding says a lot about a business, and it’s something firms need to get right from day one – from a good logo to a suitable font. 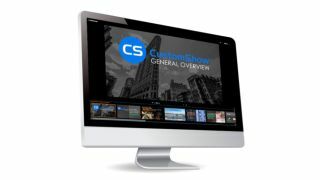 CustomShow is business presentation software that puts all these elements of branding first. Using the system, you can design and present customised, branded presentations that reflect your company and the products you offer, featuring the aforementioned logo and custom fonts. As well as this, you get a slide library and analytics to ensure your presentations are a success. What’s more, you can import presentations into the software, and use it to tweak them further. There’s also integration with SalesForce, and because the platform is cloud-based, you can access your presentations on computers, tablets and smartphones. Considering the focus on branding, this offering could be good for marketing and sales teams, and it's used by major companies such as HBO and CBS Interactive. Just like CustomShow, ClearSlide has a niche focus for companies. The platform is targeted at firms looking to generate successful marketing campaigns, pushing sales via presentations (and more), not least through a range of analytics and metrics to work for sales and marketing. Late in 2017, ClearSlide joined the Corel Corporation. Previously, ClearSlide bought SlideRocket (a few years ago) and has integrated its presentation might into a wider sales engagement platform. With the product, you can upload a range of files, including PowerPoint, Keynote, PDF and Excel. ClearSlide is integrated with other platforms, including Google Drive, Dropbox and Salesforce. This system is pretty complex and may offer too many irrelevant features for some businesses, but you can create customised content that reflects your company and the message you’re trying to get out to customers. There are also some good metrics and analysis features, and you can sign up for a free trial before making any decisions. The real strength of ClearSlide comes from its focus on sales and marketing data, not least being able to track user engagement alongside other metrics. Pricing starts at $35 per user per month (when billed annually), but there are additional tiers that introduce more features and expanded limits for a higher cost. Any presentation app will allow you to personalise your slides to at least some extent, but Haiku Deck goes one step further than the competition. It comes with a wide range of themes suited to different needs, and you also get access to 40 million free images from the Creative Commons collection. When it comes to creating a presentation, you have the option to do so on the web, which means your presentation is accessible across the range of mobile devices as well as desktops. Regardless of the device used, you’re able to select from a variety of different fonts, layouts and filters to make the perfect presentation. The great thing about these various customisation options is that they’re categorised into different industries and use-cases. For instance, you’ll find themes for teaching, cooking, real-estate and startups. Most of the features require you to be online, but hopefully you’ll have a sturdy net connection wherever you go. Pricing for a regular Pro account is $9.99 per month when billed annually. However, if you only need Haiku Deck for the short-term, then it costs $19.99 per month you use it. It’s all too easy to end up creating a presentation that’s unappealing, and the last thing you want to do is make the audience fall asleep. SlideDog lets you combine almost any type of media to create a rich presentation that’s sure to keep the viewers’ peepers open, avoiding the ‘cookie cutter’ look that makes presentations seem dull. Marketed as a web-based multimedia presentation tool, it gives you the ability to combine PowerPoint presentations, graphics, PDF files, Prezi presentations, web pages, pictures, videos and movie clips. You can drag these into custom playlists and display them to your audience with ease. You’re able to remotely control your presentations and playlists from your smartphone, the web or a secondary computer, and there’s also the option to share slides in real-time. Audience members can even view your slide from their own devices by clicking a link. That’s a handy feature if you’re looking to create an immersive presentation experience. SlideDog is probably the cheapest of the presentation software featured, with a free account that will cover the essential features. However, for live sharing and premium support you can upgrade to a SlideDog Pro account for $99 per year, which is still a discount on most similar platforms. Prezi Business is one of the more unique presentation tools. Instead of presenting your graphics and text in a slide-to-slide format, you can create highly visual and interactive presentation canvases with the goal of “emphasizing the relationship between the ideas”. Presentations can also be tailored to the specific audience, as this is a flexible platform that’s capable of skipping ahead, or veering off into a side topic, without having to flip through all the slides to get to a particular bit. For business users, there are a variety of handy tools available. By downloading Prezi Business, you can build and edit presentations with your colleagues in real-time, which is perfect for companies with teams based around the globe. When you have created a presentation you’re happy with, you can present it live (in HD) and send a direct link to viewers. There are some analysis tools here, too – you can see who’s accessed your presentation, which parts of it, and for how long. The app is available for Mac and Windows devices. If you'd prefer the Prezi Business conversational approach to presentations, there are three tiers available. Standard, for personal use, is priced at $7 per month, whereas for more features you can go for the Plus package at $19 per month, or Premium for $59 per month. Google Slides is part of the G Suite of office tools intended as an online alternative to Microsoft Office. It may seem a little limited by comparison to Powerpoint, but as it's browser-based that means cross-platform compatibility. Additionally, it allows for collaborative work, and Google Slides really works well here. On top of the fact that it integrates with the rest of the G Suite apps, not least G Drive, and you have a contender. Zoho Show is another of the many, many tools and apps that Zoho have made available for business use. It also operates in the cloud so it's accessible to any device with a browser, and it also allows for collaborative work. You can also easily share the link for users to download, or provide a live presentation online. The updated version has a simpler and easier to use interface, and comes with a free version and a paid-for one with expanded features. Slides comes with a lot of features in an easy to use interface, and involves setting up presentations using drag and drop into an existing grid. It's also internet-based so there's no software to download, and it only requires a browser to use and access. Pricing starts at $5 per user per month, and comes with 1GB of online backup storage and the ability to export to PDF. Collaborative options become available with the Pro plan at $10 per month, with unlimited available in the Team plan at $20 per month. Evernote is normally thought of as just note-taking software, but it does provide the option to create a presentation you can share online or with an audience. In that regard it's a little more limited than the other options in not being dedicated presentation software. However, as an easy and handy way to pull together a presentation quickly it could serve as a back-up or last-minute option, especially if Evernote is already being commonly used by you. LibreOffice Impress is part of the open-source suite offered as a free alternative to Microsoft Office, and comes with a powerful array of tool and editing options for your presentation, not least working with 3D images. It's supported by a large community, so its easy to find an array of additional templates. If there is a limitation it's that it's software you download and install rather than web-based, but any presentations created should be easily portable to the web if needed. Keynote by Apple is the proprietary alternative for Microsoft Office, provided free on the Mac and for iOS. It's a simple to use and as expected has some really neat design features, not least through its use of animations. You can also use your iPhone as a remote when making presentations in person. Adobe Spark does things a bit differently, as rather than just use images its geared toward video as well. This makes for potentially more powerful multimedia presentations, especially as Adobe also have a big selection of photos and images available for its users. There is a free tier for core features, but requires a subscription of $9.99 for custom branding, personalized themes, and support.